The Hinge Joint 2D allows a sprite controlled by 2D Physics to rotate around a point. In this video, we cover the basics of the 2D Hinge Joint and show a few simple uses. while being controlled by 2D rigidbody physics. and spring loaded trap doors. attached can work together to make a chain. point which the sprite will rotate around. or another sprite with a 2D rigidbody attached. 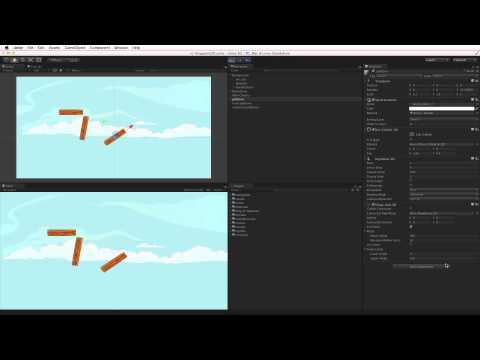 rigidbody and the 2 anchor properties. the other sprite must have a rigidbody 2D attached. A reference to this rigidbody 2D needs to be made. on to the connected rigidbody slot in the inspector. Connected Anchor need to be set. define a single pivot point. these values are in world-space. it is important to note the Collide Connected checkbox. the collide connect is selected. properties for the hinge joint. The hinge joint can be actively powered by a motor. joint 2D will apply torque and rotate the sprite. per second the motor will try to reach. will be prevented from making a full rotation. rotation allowed by the limit. limit of the joint in the scene view. create new and interesting behaviour. One use would be to make a spring-loaded trap door. components to make the links. with a hinge joint 2D. Note that collide connected is deselected. At the bottom is the 16 tonne weight. to give the weigh a proper feel in the scene.